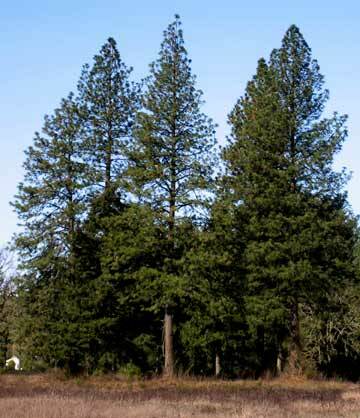 Oregonians are accustomed to seeing these tall, straight-trunked trees on the east side of the Cascades, so people are surprised to learn that the Willamette Valley has its own variety of ponderosas that do very well in the wetter climes of the valley. Genetically, they are two distinct races and neither does well transplanted to the other’s habitat. The field work for a native stand mapping project was completed in the fall of 2002. Over 950 stands were recorded throughout the Willamette Valley from Beaverton to Cottage Grove. Ponderosa pine bark smells of vanilla when scratched and the red-orange ‘jigsaw-piece’ plates of the bark of the mature trees are unmistakable. It’s quite easy to differentiate the long, three-needle bundles of ponderosa pine from the shorter, paired needles of the lodgepole pine or the five-needle bundles of the western white pine or the sugar pine. Ponderosas typically grow on drier sites, with shallow or no slope, and prefer lots of sun. They do well in moderately drained soils, but can survive in finer, silty soils. Individual trees can be seen towering above a forest, but usually these originally grew out in the open and the forest later grew up around them. They are often seen in oak savannas or woodlands and many of the same animals that prefer oaks will take advantage of the pines for habitat, food, and refuge. For example, western gray squirrels feed on the pine seeds and nest in the branches, and hawks and owls use the high crowns of the pines for nesting and perching points. Botanical archeologists have identified pollen from our ponderosa pines several thousand years old and, based upon the pollen counts in soil core samples, have estimated the ponderosa populations peaked and held steady for about 7,000 years, until settlers from east of the Rockies moved into Oregon in the mid-1800’s. The Latin name ‘ponderosa’ means ‘heavy (for the wood), and indicates why ponderosas have been prized for timber from the earliest times of Oregon settlement. The grain is typically straight and free of defects in a healthy stand. The wood is durable and has natural decay resistance that makes it an excellent wood for construction and finish carpentry. In fact, these traits led to the decline of the valley’s ponderosas over the last 150 years. Today, the Willamette Valley Ponderosa Pine Conservation Association (westernforestry.org/wvppca/index.htm) actively promotes seed collection from trees and stands throughout the valley to provide native source seedlings for replanting. If you are looking for a tree that will achieve a grand height and add wonderful character to both your yard and your neighborhood, a Willamette Valley ponderosa pine is a fine choice. Here's a list of the 2005 Seedling Nurseries that carried Willamette Valley Ponderosa seedlings. They may or may not have them this year. Remember, fall is the best time to plant a tree! (Word doc, 40Kb) And please note: this will grow to be a very large tree that may drop lots of needles and cones.